A ruptured eardrum is a tear or a hole in the eardrum and it is medically referred to as perforated tympanic membrane. 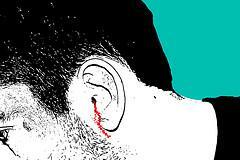 Eardrum is actually a thin piece of tissue which separates the middle ear from the ear canal. If a person suffers a ruptured eardrum, he or she may experience infections, injuries and sometimes even temporary hearing loss. Most cases of ruptured eardrum heal on their own without any treatment, over the course of a few weeks. Some cases still may need some treatment methods simply to accelerate and enhance the process of healing. Rare cases of ruptured eardrum can only be resolved by a surgical intervention. There are certain signs and symptoms which can easily identify the medical condition as a ruptured eardrum. Those may or may not include vertigo, vomiting, nausea, spinning sensations, ringing in the ears (which is medically referred to as tinnitus), hearing loss, bloody, pus-filled or clear drainage from the affected ear and constant ear pain that usually stops suddenly. If a person experiences any of the aforementioned symptoms it is a good idea to pay a visit to the doctor in order to find the most appropriate treatment method and avoid further complications and injuries. An eardrum has two primary roles. It is there to protect the middle ear from water, bacteria or any other foreign substances which may be harmful. It also provides the ear with the ability to hear. When a sound wave strikes the eardrum it vibrates and the waves get transferred into nerve impulses. There are various causes of perforated or ruptured eardrum and the most common ones include severe head traumas, foreign objects in the ear, acoustic traumas, loud sounds and noises, barotrauma and infections of the middle ear. Severe head traumas may dislocate the eardrum. Barotrauma is excessive stress on the eardrum caused by air pressure. Middle ear infections are often associated with the accumulation of fluids in the middle ear which may rupture the eardrum. As already mentioned, most cases of ruptured eardrum resolve on their own, over the course of a few weeks. Treatment options include eardrum patches and surgical interventions. These patches are made of paper and they are applied over the hole in order to stimulate the growth of new tissue. If the aforementioned patches are not helpful enough, the condition may require a surgical intervention. During the healing process the ears need to be kept dry, and they should not be cleaned. What are these rashes I have on my inner thigh? Can anyone tell me, please?